Rogue River, OR (August 2007) – Wagner Electronics is offering a free moisture meter upon completion of certification classes at the National Wood Flooring Association (NWFA). The NWFA recognizes the importance of moisture testing during the installation process and strongly believes that proper moisture testing can help alleviate potential flooring failures. The recently published 2007 NWFA Installation Guidelines details the recommended moisture measurement and testing requirements. Determining moisture content is an essential part of quality control within the flooring installation process. Flooring installers must know the moisture content of the wood flooring, as well as the subfloor. The industry standard for determining accurate moisture content in wood is the oven-dry test, but due to the high cost and impracticality of performing on-site oven-dry tests flooring installers use hand-held moisture meters. 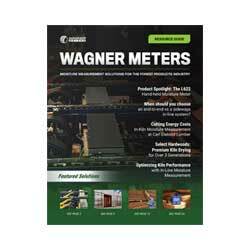 For more information about Wagner Electronics’ moisture meters go to www.moisturemeters.com or call 800.944.7078. For a list of NWFA certification classes go to www.nwfa.org or call (800) 422-4556.